Ergonomics training, job analysis and follow-up activities are offered by The University of Michigan, College of Engineering, Center for Ergonomics, which has support from the State of Michigan to provide ergonomics training and service to a limited number of small and medium sized Michigan companies free of charge. This project is funded by the State of Michigan under a Consultation Education and Training (CET) Grant awarded by the Michigan Occupational Safety and Health Administration (MIOSHA). MIOSHA is a part of the Michigan Department of Licensing and Regulatory Affairs (LARA). Work related musculoskeletal disorders such as low back injuries and upper limb musculoskeletal disorders are a major cause of disability and workers’ compensation throughout the United States. The objective of this project is to provide employers and workers with information and procedures necessary to identify and control the conspicuous ergonomics workplace risk factors of musculoskeletal disorders. Grant personnel will develop customized on-site introductory ergonomics training seminars that will provide introductory ergonomics information, workplace examples to illustrate ergonomic risk factors and job design principles. The seminars will be customized by utilizing risk factor examples from participating companies as well as facilitated job analysis case studies. This will be available to six small or medium sized companies within the State of Michigan. In addition, limited follow-up activities will be conducted with the six participating companies to document the integration of ergonomics within the company and workplace changes. These activities provide an excellent opportunity for Michigan companies to initiate or expand their ergonomics activities. Small and medium sized firms often rely on external resources to assist them with ergonomics training, program design and job analysis. 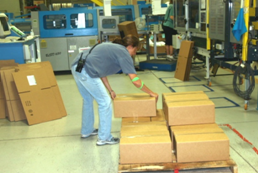 Past ergonomics CET grant activities conducted by The University of Michigan Center for Ergonomics have been in high demand because of the high quality training and service that is provided by the project staff.